I don’t know… but those two hats look pretty pathetic to me. If you can’t compete with the giant sombrero, why bother even trying? If you haven’t been to either of these carts yet, don’t get too excited. While they’re both ok, they bear more resemblence to a gringo family’s “taco night”, than something that could actually be referred to as Mexican. In other words, if you like nacho cheese, and hard shelled tacos you’ll love both of these carts. For those of us looking for a more authentic taco experience, we’ll keep holding out that Patty’s Taco Truck will return. Posted by Zach Brooks at 10:43 am, June 24th, 2008 under 50th btw. 6+7th, 54th btw. Mad+Park, Cart, Mexican. It’s not how big your sombrero is, it’s how you use it. Now, now… there’s no reason to get a big head. 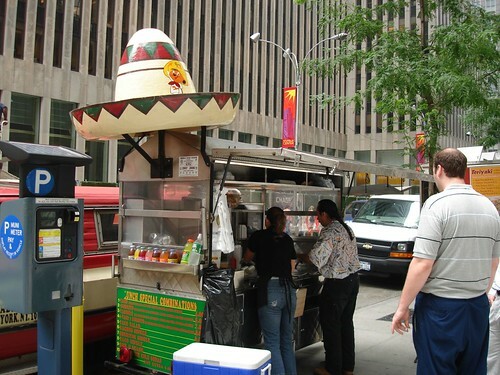 The big sombrero (which I affectionately call Carne de Calle) is one of my favorite carts. They are very clean and the food is great. 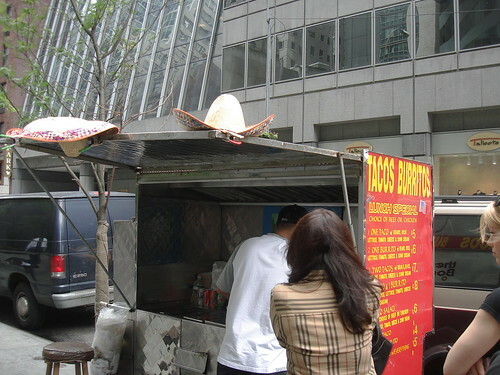 I’ve never had any nasty reactions to their food :) It used to be my mainstay when I worked at 50th and 6th. I loved the cart in the picture. I’m sad that my office moved 2 blocks south. rice is flavorless, may as well be white rice. i should have went with the review…this is a miss.